A related aside: I don’t know why I remember this, but I was a freshman in college and had just strolled out of my dorm room, walking down the hall in sweatpants and a long-sleeved shirt, when I received a text from my older, not oldest, brother which read, simply: “Grizz gonna Grizz.” It was April 29th, 2011; I have to have been in the midst of preparing for finals at that point. It was the night the Grizzlies upended the San Antonio Spurs, 99-91, in Game 6 of their first round Western Conference playoff series. A few things to note here: 1) at the time, Derrick Rose was the NBA MVP, and now, for reasons so far beyond me that I can only imagine what 2015 Mo Williams would’ve been like in an All-Star Game, is in serious contention for fan vote All-Star considerations; 2) my older, not oldest, brother is and never has been especially interested in NBA basketball except as a means with which to ridicule me when my favorite team, the New York Knicks, whom I despise, fall flat on their faces; and 3) to neither of us did the Memphis Grizzlies mean especially much, except, as you may expect, as a means of disruption, and I don’t mean of the TED Talk variety. But the NBA affords us the courtesy of watching people develop in nurture-heavy conditions, despite what the nature is or was. To their credit, the Grizzlies showed their hand in the former, bringing along Pau Gasol and Mike Miller, as well as Shane Battier, all of whom moved onto greener pastures. When Z-Bo rolled into town, in 2009, he immediately became an All-Star and, finally, the populist low-post heir apparent that he’d already been for years; when Tony Allen arrived in Memphis, in 2010, he brought the credibility of a champion from his time with the Celtics. Allen became the Grindfather, who lived in the Grindhouse; Randolph became a kind of huggy bear of the back-you-down mentality, content to pass it on to the Gasol brother who’d made the Gasol-Gasol trade possible. The Grizzlies were never going to win a championship. They battered and bruised the NBA’s best players and teams into disbelieving in themselves, by strict virtue of believing in themselves so wholeheartedly. No team has gone into Memphis since 2009 and assumed victory. 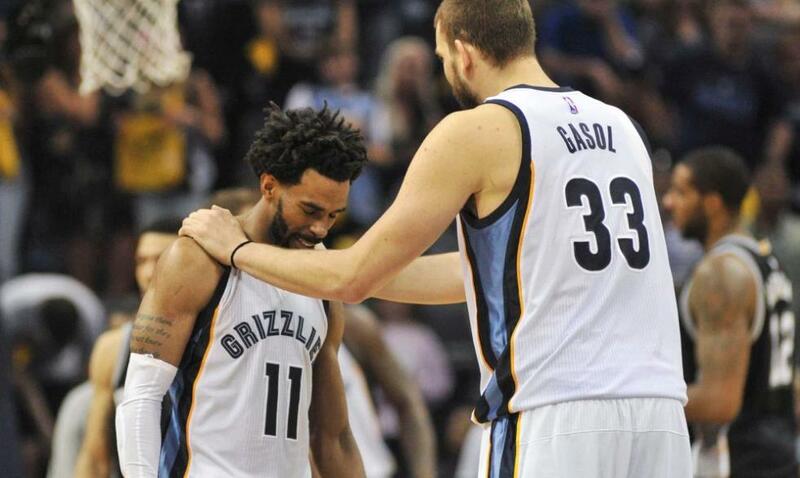 Gasol and Conley have been the cornerstones of that, and are the last remaining pieces of that. Through coaches Fratello, Iavaroni, Davis, Hollins, Joerger, Fizdale and Bickerstaff, Conley and Gasol had their own magic on the pick and roll, something that became all the more apparent when, after taking on the three-point line as a stretch-center, Gasol’s percentages dropped following a Conley injury last season. This is what we leave behind from the teams that we cherish in the moment, but they bring us such endless joy in those moments that it’s hard to depart from them completely. If the NBA were anything like the rest of the late-capitalist economy, in which the best employees left for better companies doing more interesting things, Mike Conley would’ve been a San Antonio Spur a decade ago. After earning Defensive Player of the Year honors, Marc Gasol would’ve been maximizing himself as a Warrior around 2015, and Draymond Green might not have ever happened. Old heads, or what remain of them, like to talk about the way things used to be, and how players like Steph, LeBron, Klay, Harden, Giannis and the rest would never have made it. It might be true, given the rules in those old heads’ respective times; Steph Curry would have been Pete Maravich with God on his side in 1977, without the three-point line. The Grizzlies of this vintage were as close to old-head philosophy as could be, generally eschewing pace-and-space in favor of mortar-and-pestle. It wasn’t so much that they didn’t want to be future-facing; it’s that they found a way to play that was uniquely their own which just happened to elicit wild adulation from their home fans. Marc Gasol posted a triple-double on Wednesday night. Perhaps it was retaliation toward management for making him merely a commodity worth more than his humanity; I’d be mad if I was Marc Gasol at reading something like that. The Memphis Grizzlies are Jaren Jackson’s team now. It’s odd because he’s 19, and he’s on the team with the two players who, when anybody says “grizzled veteran,” they’re referring to, but he’s Memphis now, and he fits. They kept us, all of us, in check. Whatever happens to the two final pillars of Grit ‘N’ Grind, disintegrating before our eyes, just remember the moments in which you rocked your head back, shaking, and said, “You know what? That’s fine. They’re alright.” That’s these Memphis Grizzlies. This has happened with such regularity since my brother became incredibly aware of that woebegone inclination that he basically ceased those hit jobs in 2015 or so; shout out to Brian J.